Should you walk along Stoke Road, starting from Station Road, go past the college and Howard Place into Snow Hill, descend into Victoria Place and Broad Street, before climbing Piccadilly to Stafford Street, you will have touched each of the boundary limits of Shelton. That's how big the place originally was - and it was full of big houses and parks. Historian Steve Birks says: "Its history goes back to Domesday and you can imagine it as a shelf overlooking the pretty Fowlea Valley and the town of Stoke itself. "In 1700, its population was greater than Hanley's and its nearest rival was Penkhull. "A little later the land seems to have been claimed by a number of famous potters who built expansive houses and mansions here. There are still many good examples of these lavish buildings, although the best have been demolished over the last 60-odd years." The road journey is itself a history book. 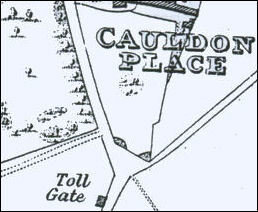 "The road from Stoke to Hanley was turnpiked and the 1832 map shows the tollgate near to Cauldon Place," says Steve. "The building still exists as a newsagent and it's not all that long ago, say 50 years, when you could actually see from its shape where the tolls were taken." On the same side as the tollgate building is Hanley Cemetery, which stands on part of the early Shelton Hall Estate. 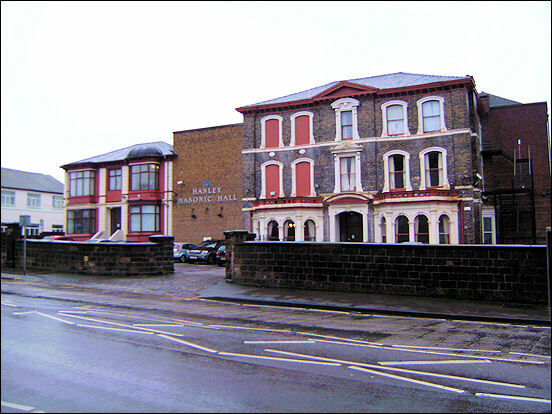 Shelton Hall was built in 1782 for the Chatterley brothers who were prominent Hanley potters. It was knocked down in 1959, and industrial units stand there now. "It was a very impressive, square, three-storey building with a lower wing to the north," says Steve. 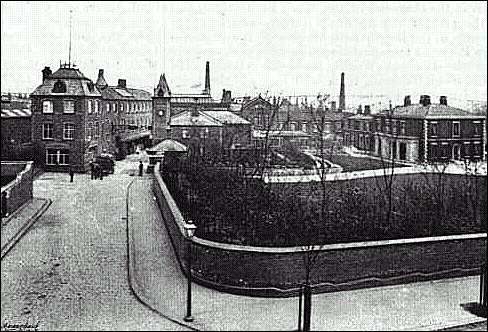 "It had really spacious gardens which much of it, in 1860, was hived off to lay out Hanley Cemetery. "But by this time the house had passed through a number of occupiers and had become a private school. A more important house though was Shelton Old Hall which stood at the top of Snow Hill. This was the Elizabethan-style home of the Fenton family of whom Elijah Fenton (1683-1730), a lawyer, achieved some fame as a poet." a 1893 advertising and trade journal. But the big family who came to provide industry were the Ridgways, who built the sprawling Cauldon Pottery. These days the whole of their land is occupied by Stoke-on-Trent College. Steve says: "The Ridgways were important to the development of Hanley as well as Shelton, in that they provided housing and work. "In Shelton, the first Ridgway of note was Job Ridgway who built the Cauldon Works around 1802. You can judge by the size of the college how big the pottery was. Job was also important to Methodism and was one of the founders of the New Connexion in Hanley, which gave rise to Bethesda Chapel." The massive pottery, known as the Cauldon Works, was taken over from the Ridgways in 1859 by Brown-Westhead and Moore. But by 1938 it was run down and devastated by fire. The use of the site for further education originated in 1946 when the newly-created building department of the technical college was built. Passing though Howard Place today, you can still enjoy the relics of those important times in the presence of a group of imposing flats that were built by the architect Robert Scrivener, who built the Queen's Hotel which later became Hanley Town Hall. Here also, on the corner of Howard Place, are the striking offices of a self-made wholesale grocer name Berks. 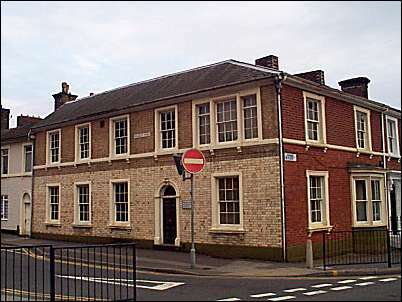 He built a gothic house directly opposite his warehouse, which is now the Elms Restaurant. to the right - Thomas Ford's house. 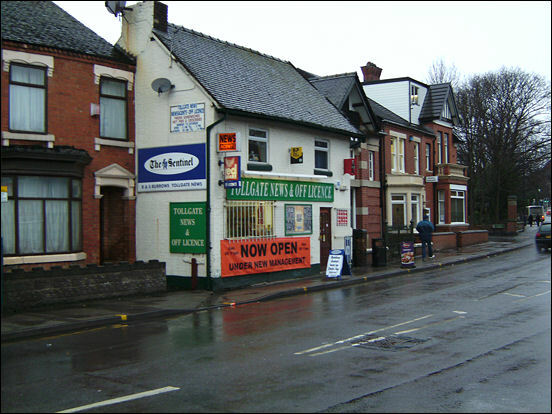 "The Hollies"
This property and the next door house are now used as Hanley Masonic Hall. Then there are the Hollies with stone columns and bow-arched windows built by the Ford family who owned Cannon Street Potteries. But for me the most interesting is a modest shop-front that goes under the name of Ghazni Jewellers. "This is number 20 Snow Hill," Terry Abbotts, a Clarice Cliff historian tells me. "These apartments are where Clarice Cliff lived from 1936 until she married her boss Colley Shorter in 1940. By this time of her career, Clarice had reached the heights of international fame and, it has to be said, was engaged in an extra-marital relationship with Colley." I love the expression indifferently 'applied in tabloid journalism, "love nest". But 20 Snow Hill Shelton was exactly that. "It must have raised a few eyebrows. But Clarice really loved this place, and gave many receptions. And there's no doubt that her main visitor would have been Colley Shorter. Not long after his wife died, Clarice and Colley married and she moved into his Arts and Crafts house in Clayton." 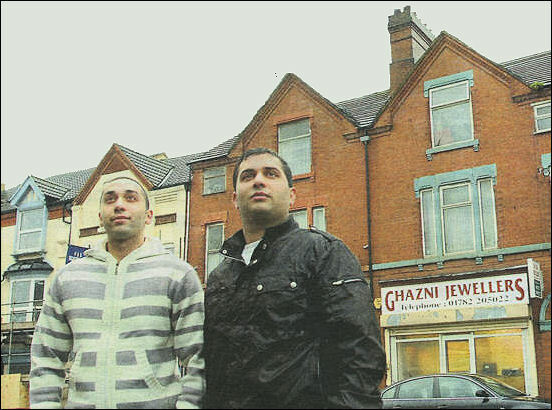 Usman Aslam and Shiraz Minhas run the jewellers and currently own Clarice's flat. Usman says: "It's only recently we discovered the connection with Clarice Cliff. I suppose the flat is still the same as when she knew it. Not a lot has changed in the structure. Obviously the district has changed. Places do, don't they?" It is now Ghazni Jewellers, staffed by Hassan, left, and Uslam Aslam. Unimposing it might be, but it's this bit of social history that brings colour to a road we often travel without stopping.